The video above is all about hashtags, so if you’re stuck with your Instagram hashtag strategy, then make sure to watch the video, or continue reading this blog because I’m going to be getting into all the details on how you should be using your hashtags for Instagram. So first let’s talk about what hashtags actually are. Hashtags are little search engines inside of Instagram that help you get seen. They are a great way to grow your following slowly over a longer period of time. They are not made to get you a bunch of followers over night, but if you use your hashtag strategy properly, you will be able to get found and they can definitely help you grow. So here’s the thing. I see hashtags as stumble upon marketing. 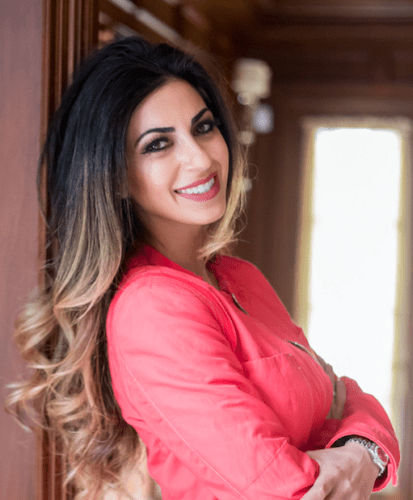 I’m a cosmetic dentist, and I have used Instagram to build my business. But let’s be honest, nobody is searching Instagram to find their dentist. But people found me because they stumbled upon my page. Stumble upon marketing is basically when somebody is just browsing the web, or in this case Instagram, and they stumble upon your photo, your profile, and your content. And when they stumble across your page, you want them to be so excited and think themselves that they need what you are offering RIGHT NOW! By the way, if you’re in my program, Grow With The Gram, make sure to go back to the lesson on hashtags and do the work for that section. It’s a game changer. If you’re not in my program, continue reading because I’m going to give you access to a guide that will help you with your Instagram hashtag strategy. So let me break this down into an example for you so you can easily digest it. new followers that transition into an actual patient. If you are using hashtags that are relevant in your field, such as, therapist problems, therapist memes, therapist life. . you’re likely going to attract other therapists. So you want to make sure you use hashtags that your ideal patient would use. So the key to your hashtag strategy should be specificity. Use hashtags that your ideal patient is looking for, not necessarily the hashtags that your colleagues will use to find you. In order to identify what these hashtags are, you need to put yourself in the shoes of your ideal patient. What is it that they are looking for? How to they spend their spare time? What was the last show that they watched? Once you can really target who your ideal patient is, you’ll be able to answer all of the questions. If you’re having trouble with this, here’s a link to my a video that helps you identify your ideal patient. One final tip with your hashtag strategy is to make sure you are using smaller variations of hashtags. If a hashtag has 1 million posts to it, I don’t recommend using it because your post can get lost really quickly and you won’t have a big chance at being seen. When you use hashtags that have less posts to it, for example, 150,000 posts, your photo has a bigger chance of being seen and you have a higher chance of being ranked in the top posts for that hashtag. This will help you get discovered! I hope you now have some clarity on how you can start developing your hashtag strategy for your business. As always, I have a freebie for you to download. It’s a hashtag strategy guide that will help you come up with the hashtags you will need in order to get found. Make sure to download it from below. It will put you on the right track and save you so much time, and make your posts so much more effective. Make sure to download the guide and get to work! Also, make sure to share this with your fellow healthcare professionals! I’d love to know how you’re doing so if you have any questions, feel free to leave a comment or find me on Instagram, and I’d be more than happy to help you!